Donald Trump, speaking from Air Force One, said Friday the U.S. is ready to slap tariffs on an additional $267 billion worth in Chinese goods. After surging 33 percent in 2017, the iShares China Large-Cap ETF (FXI), which tracks certain Chinese stocks, fell 1.1 percent to 40.91, down more than 11 percent YTD while the S&P gained more than 7 percent over the same period. Now the question is whether recent selloff is a pause that refreshes or it’s a beginning of a deep correction? Below is an update look at a trade in FXI. Our “U.S. Market Trading Map” painted FXI bars in red (sell) – see area ‘A’ in the chart. 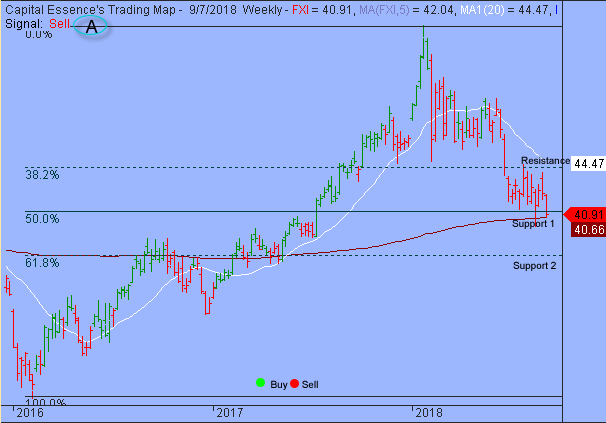 Over the past few weeks, FXI has been basing sideways using the 50% Fibonacci retracement of the 2016 to 2018 upswing as support. Last week’s selloff pushed the ETF below support, signify…Click here to read more.